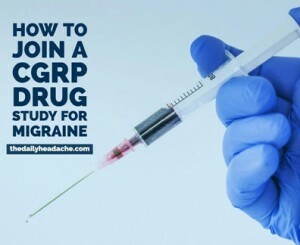 The logistics of finding a CGRP drug study are relatively simple—the hard parts are meeting the study criteria and living close enough (or being able to travel) to a location that needs trial participants. ClinicalTrials.gov is a registry of medical studies around the world. You can search for studies on any condition you’re curious about and can narrow the list by location. It’s the most detailed search, but can be overwhelming. CenterWatch is another database of clinical trials. You can search studies and research centers by condition and/or geographic location. It has less information than ClinicalTrial.gov, but the format is easier to follow. CenterWatch offers a free email notification service of new trials. Don’t take this list as the only options—doing your own search with your own terms might turn up something I missed. You can save time by limiting results to the state you live in. New studies are added all the time, so be sure to check back for ones that you might qualify for. Or sign up for CenterWatch’s email alerts. To really know how a drug or treatment works, researchers need to compare similar patients to each other. To do this, they must limit participants by certain eligibility criteria, which vary from one study to the next. Read through a study’s eligibility requirements closely—you may meet all the criteria except one (that’s usually the case for me). Frequency of migraine attack is a major criterion; how many preventives you have tried, drug allergies, recency of Botox injections, or having an uncommon subtype of migraine are some examples of other criteria. Depending on the study and where you’re searching, the contact may be a specific doctor or hospital, company that runs clinical trials, or a general contact phone number or email address. If you see the name of the center, but no phone number, Google the name and go from there. I’ve never had a central contact respond to email or phone calls, so I recommend trying every other possible avenue as well. Talk to your doctor, too. They may know about trials in the area or have information on upcoming studies. This is most likely if you see a headache specialist at an academic headache center, but it’s worth a try even if you don’t. Having the option of clinical trials is great for patients who need relief and want to try a new treatment, but they are still experiments. You may get a placebo. You may get the active drug, but at a lower dose than is effective. You may experience side effects that are not yet known. These risks are worth it to some people and not acceptable to others. If you are chosen for a study, ask every question you have and don’t agree to participate unless you are satisfied with the answers. Try to view the risks as objectively as possible to make the most informed decision you can. People can die during drug trials—that’s exceedingly rare and the CGRP drugs have had mild side effects in studies so far—but it’s important to try to keep your eyes wide open. It’s so easy to be blinded by a desire for relief (I speak from experience). If you’ve participated in in drug studies and would like to share your experience, please leave a comment or email me at kerrie[at]thedailyheadache[dot]com. Oh, woah, I was never getting anything to *induce* a migraine though, that sounds terrifying. So I was in a study with AMG334 but a different one. Yikes. I just completed a clinical trial, which lasted over a year. First of all, it was one IV infusion, and I noticed no difference. It was hard to qualify and involved months of tracking just to qualify. Travel was about an hour/an hour and a half, not too bad. Nightly computer entries. Biggest hassle was family and friends thrilled to find I qualified, then hopeful to hear about relief, then misunderstanding that it was ONE SINGLE treatment, yet they continually asked me HOW’S the trial going? I kept telling them it’s over, it did nothing. Yet I had a year of follow ups so was continually going to monthly appointments. Each time they would hopefully ask how’s it going? I would have to patiently explain again how it was one treatment. No open label, so I’ll never know if this was yet another failed drug, or if I had placebo. And the dr in charge of my case seemed to be a retired dr. He was hard of hearing and seemed not to understand my answers to his questions. The technicians were amazing. I would definitely do this again. And yes, my head hurts as I type this. That was the Alder drug. Yes, it will be approved. All of the CGRPs should be approved at some point. Im glad you had good experience with the study. That is very exciting. Looking forward to the future. I’m currently in a CGRP trial through Radiant Research. The visits take about 2-3 hours with travel time, and it’ll take five monthly visits total. I also have to fill out a little e-diary each day–had to do this for a month to make sure I qualified, and now ill continue till one month after my last injection. Im feeling pretty hopeful–I had my first set of subcutaneous injections (OUCH!) 1.5 weeks ago and I haven’t had another migraine yet, not even after several nights of not enough sleep, hiking in bright sunlight, exposure to smoke, chocolate and caffeine, missed meals…all usual triggers for me! I’ll get a little shadow of pain in the spots where my migraine pain starts, but then it just fades away! This study is looking at whether one big quarterly dose or three small monthly doses work better…so I got three shots the first month (either a triple dose of the drug or one dose and 2 placebo shots) and will get one at each of my next two monthly visits. I like that, with the study designed this way, you have a 66% chance of getting *some* form of the treatment. Whoa, this truly sounds amazing for both of you, Holly and Elizabeth. Hopefully these will be a success. I read about these trials quite a bit but none available in my area. I really hope they will succeed and that insurance will not be a pain. Wondering if they do pass FDA approval, if the injection will be done at the doctors office or at home using an injector similar to Sumatriptan (which honestly does not work for me). Good luck to you and to the companies developing the medication! I am also receiving in a cgrp study. I used to have an intractable chronic migraine with variable levels of pain ( functionally still working but with great difficulty) even with a 4 lead neurostimulator. Took about 10 days to notice the medication was working. I still have some tinge of daily pain in the best of days but I get pain free periods almost every day, even on my period. The overall level of pain has been reduced significantly. I can attempt to travel, not be totally afraid to go to work, enjoy my family. It is not a magic bullet but it is the best thing out there for us ( for me at least and I have tried lots of things). I shudder to think that I would have to do these injections at home, though I guess they’re no worse than what diabetics do daily!